Rev. 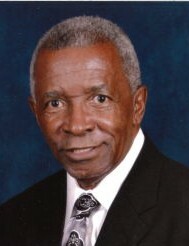 Dr. Willie C. Stovall was born August 29, 1938 in Miami, FL to the late Spencer and Josephine Stovall. He attended the public schools in Tifton, GA and Miami, FL. He attended Florida A&M and Jacksonville Theological Seminary where he received his BA, MS and PHD in Ministry and Theology. He entered the U.S. Army during the Vietnam era and he retired after 20 plus years. He also retired from the Clay County Sheriff’s Department. Rev. Dr. Willie C. Stovall held memberships in the American Legion #373 and Life Member of the NAACP and Honorary Member of the Florida Sheriff’s Association. He served as an Associate Minister of the First African Missionary Baptist Church, the Male Chorus and Brotherhood Ministry, until his health failed him. He enjoyed golfing and fishing. He was preceded in death by his parents, Spencer and Josephine Stovall; son, Eric Bernard Stovall; brother-in-law, Fredrick McGee; grandparents, Clowers and Daisy Murphy McGee. He is survived by his loving and devoted wife of 50 years, Rev. Patricia A. Stovall; daughters, Raiana Marie Stovall, Angelia Michelle Stovall, and Tedie (Alfonso) Teate; two grandsons, Marvin Leroy Williams II and Dorianh Ward, Sr.; six great-grandchildren; aunt, Thelma Turner of Gadston, AL; uncle, John (Dorothy) McCree of Akron, OH; brother-in-law, Raymond B. Black of Haddonfield, NJ; sister-in-laws, Ethel Sturdivant of Detroit, MI, Patricia McGhee of Pennsauken, NJ and Deborah D. Black of Gadston, AL as well as a host of other family and friends. A visitation will be on Monday, April 22, 2019, 9:00 a.m. to 11:00 a.m. followed by the funeral service at 11:00 a.m. Both services will be at Aaron and Burney Bivens Funeral Home, 529 Kingsey Avenue, Orange Park, Florida 32073, (904) 264-1233. Interment with military honors will follow the funeral service at 1:30 p.m. at Jacksonville National Cemetery, 4083 Lannie Road, Jacksonville, FL 32218. There's still time to send flowers to the Funeral Service at the Aaron and Burney Bivens Funeral Home and Cremation Services at 11:00 AM on April 22, 2019.